the Tar Out of Himself"
Editor's note: This article appeared in the June 9, 1983, issue of The Birmingham News. It appeared on page D1 and was written by staff writer Carl Carter. Around 10 tonight, Robert R. McCammon will sit down to his typewriter and spin yarns of ghosts and witches and demons and such. He'll do it until about 4 in the morning, then he'll go to bed and likely have nightmares. It's a fitting routine—McCammon's novels are custom-made for nighttime reading. The fainthearted should stay out; the insides of his books are for those who like blood and gore and terror. At age 30, the Homewood resident has produced five of them—four paperbacks and, just released, his first hardback, Mystery Walk. And there's more to come. Holt, Rinehart, and Winston, publisher of Mystery Walk, will publish McCammon's already-finished next novel, Usher's Passing, in about a year. "I usually have bad dreams when I'm working. I think if I'm not having bad dreams about what I'm working on, it's not affecting anybody else," says McCammon, a graduate of Banks High and the University of Alabama whose wife, Sally, teaches first grade at Leeds Elementary. There's a reason for his odd work schedule: "Day writing is different from night writing. I've tried to write during the day, and it's different. I don't think it's quite as frightening." And frightening is what McCammon is after. "I think it's really therapeutic for me, to get rid of my inner demons," he says. 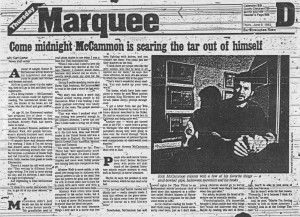 McCammon didn't just decide one day that he wanted to write horror novels. "My grandfather used to read ghost stories to me when I was a little kid. They fascinated me. "When I was a kid I used to love the horror shows they showed at the College Theater. I couldn't watch them because they scared me so much. I usually cover my eyes for the worst parts." 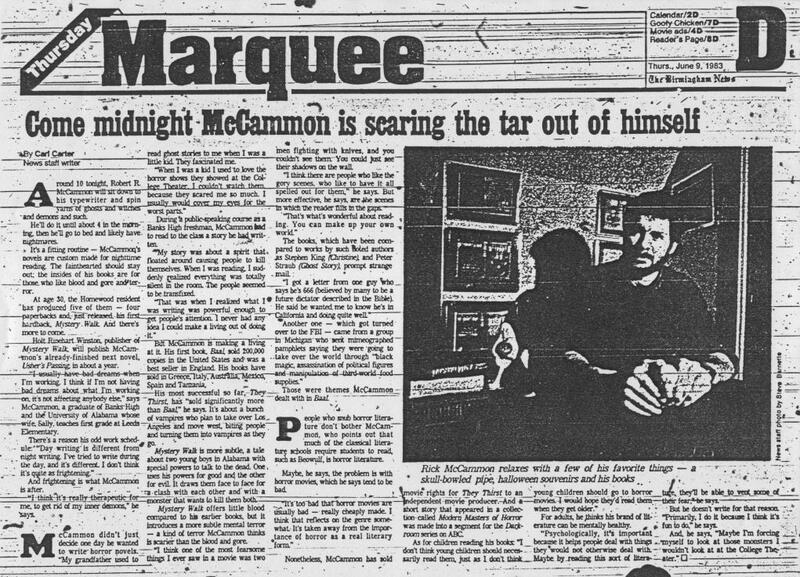 During a public-speaking course as a Banks High freshman, McCammon had to read to the class a story he had written. "My story was about a spirit that floated around causing people to kill themselves. When I was reading, I suddenly realized everything was totally silent in the room. Everybody was transfixed. "That was when I realized what I was writing was powerful enough to get people's attention. I never had any idea I could make a living out of doing it." But McCammon is making a living at it. His first book, Baal, sold 200,000 copies in the United States and was a bestseller in England. His books have sold in Greece, Italy, Australia, Mexico, Spain, and Tanzania. His most successful so far, They Thirst, has "sold significantly more than Baal," he says. It's about a bunch of vampires who plan to take over Los Angeles and move west, biting people and turning them into vampires as they go. Mystery Walk is more subtle, a tale about two young boys in Alabama with special powers to talk to the dead. One uses his powers for good and the other for evil. It draws them face-to-face for a clash with each other and with a monster that wants to kill them both. Mystery Walk offers little blood compared to his earlier books, but it introduces a more subtle mental terror—a kind of terror McCammon thinks is scarier than the blood and gore. "I think one of the most fearsome things I ever saw in a movie was two men fighting with knives, and you couldn't see them. You could just see their shadows on the wall. "I think there are people who like the gory scenes, who like to have it all spelled out for them," he says. But more effective, he says, are the scenes in which the reader fills in the gaps. "That's what's wonderful about reading. You can make up your own world." The books, which have been compared favorably to works by such noted authors as Stephen King (Christine) and Peter Straub (Ghost Story), prompt strange mail. "I got a letter from one guy who says he's 666 (believed by many to be a future dictator described in the Bible). He said he wanted me to know he's in California and doing quite well." Another one—which got turned over to the FBI—came from a group in Michigan who sent mimeographed pamphlets saying they were going to take over the world through "black magic, assassination of political figures, and manipulation of third world food supplies." Those were themes McCammon dealt with in Baal. People who snub horror literature don't bother McCammon, who points out that much of the classical literature schools require students to read, such as Beowulf, is horror literature. Maybe, he says, the problem is with horror movies, which he says tend to be bad. "It's too bad that horror movies are usually bad—really cheaply made. I think that reflects on the genre somewhat. It's taken away from the importance of horror as a real literary form." Nonetheless, McCammon has sold movie rights for They Thirst to an independent movie producer. And a short story that appeared in a collection called Modern Masters of Horror was made into a segment for the Darkroom series on ABC. As for children reading his books: "I don't think young children should necessarily read them, just as I don't think young children should go to horror movies. I would hope they'd read them when they get older." For adults, he thinks his brand of literature can be mentally healthy. "Psychologically, it's important because it help people deal with things they would not otherwise deal with. Maybe by reading this sort of literature, they'll be able to vent some of their fear," he says. But he doesn't write for that reason. "Primarily, I do it because I think it's fun to do," he says. And, he says, "Maybe I'm forcing myself to look at those monsters I wouldn't look at at the College Theater." Thanks to Dave Hinchberger for supplying the photocopy of the article.